Now, in the shot it’s really quite clear the cub isn’t sitting in an elephant’s trunk. It’s just not going to happen, right? We mean, should James be in on the Photoshop job and find the lol then boil us up and pop us in a tree – but until then we’re going to have a giggle. For those who missed the first spin this image did on the internet last year, it was initially created by Kruger National Park in South Africa and shared on its Twitter account, Kruger Sightings, on April Fool’s Day. It is a thing of wonder and nearly as good as the yarn about James, tbh. 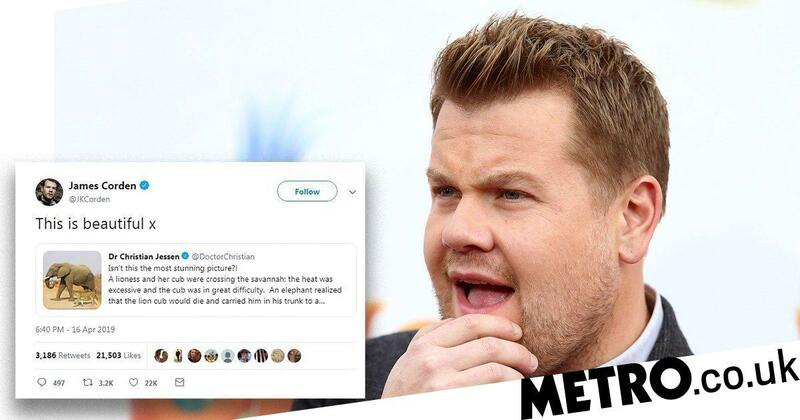 Following this week’s resurgence, the comments section immediately lit up with confused punters wondering whether Christian and James were indeed trolling us. Turns out at least Christian wasn’t, as one follower pointed out it was a fake, ‘but elephants are still amazingly smart’. Many were worried so many fell for the gag though and we’re sort of there alongside them. ‘The amount of people that believe this AND vote scares me,’ one pointed out as we neared what may be the apocalypse. Cheeky punters also threw their own works of Photoshop art into the mix as they tried to suggest the photo Christian posted wasn’t the whole thing. ‘If you look at the original there’s also a giraffe trying to eat a man in a balloon and that vulture is about to fly away with a baby hippo,’ one total comedian wrote. Let’s just pretend it was totally real and that we can have nice things.